Leamington saw two points slip from their grasp on Saturday after a late rush of blood from Jamie Hood allowed Weymouth to escape with a draw, writes Paul Okey. With play entering the last of the 90 minutes, two fine second-half saves from Tony Breeden looked like preserving the home side’s one-goal lead, given to them by Ryan Rowe’s 19th-minute opener. However, a hopeful ball into the box was not dealt with by Hood and James Mace and an ugly lunge from Hood brought down Calvin Brooks for the simplest of spot-kick awards. Charlie Davis calmly stroked the penalty past Tony Breeden and into the top corner and despite eight minutes of time added on, Leamington were unable to re-establish their lead. 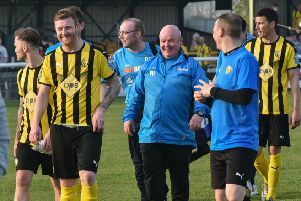 It was a frustrating conclusion to a match Leamington had controlled for long periods and saw them slip out the top three after wins for Chippenham, Dunstable and Slough. Midfielder Zak Lilly was handed a Leamington debut after joining on loan from AFC Telford on Friday, while Tom James made a start in place of the suspended Connor Gudger. James was quickly into the action, latching on to Ahmed Obeng’s intelligent inside pass and racing into the box. But, after appearing to be caught in two minds, he ballooned the ball wide. A drive from Billy Lowes proved comfortable for Breeden at the other end, while an ambitious 30-yard free-kick from Rob Thompson-Brown had the power but not the precision to beat visiting keeper Dan Thomas. Both sides clearly fancied their chances in a lively opening but it was Brakes who made the key breakthrough in the 19th minute. Obeng showed excellent trickery to outfox three men on the left-hand edge of the box and his centre was nudged into the path of Rowe who calmly steered the ball into the corner of the net. A first-time effort from Lowes was straight down the throat of Breeden after good possession football on the edge of the box from the Terras. However, it was Brakes who looked the most likely to add to their tally. Obeng miskicked a shot into Edwards after a Ben George centre had unexpectedly reached him at the far post and though he was quickly on to the rebound, forcing a fine reflex save from Thomas, the offside flag was already up. Fantastic trickery on the right from Lilly then almost saw him cap his debut with a goal to remember. The loanee worked his way out of a tight spot to find Rowe, who backheeled the ball back into his path for a first-time effort which crashed off the crossbar from ten yards. The visitors almost worked an opening when Lowes’ clever ball into the box was chested down by Ben Thomson, but with the striker off balance he could only skew his half-volley well wide of the target. A superb save from Breeden prevented Weymouth getting back on terms shortly after the restart, with Thomson the man denied followed some good pressing from Stewart Yetton. Lilly then wasted a gilt-edged opportunity to double the home side’s advantage after the ball was laid on a plate for him by Rowe ten yards out, seemingly getting his feet in a tangle before lashing his shot over the bar. Lilly then showed good strength to win back possession for Brakes but he dragged his shot wide. A long-range effort from Aaron Rodriguez failed to trouble Breeden, while there was a much closer call for Brakes as James was forced to clear a Davis header off the line. A brave Jack Edwards headers flashed past the post at the other end but as the game entered the final ten minutes, it was Weymouth who were asking all the questions. A Hood stumble in the box brought fierce handball appeals as he fell on to the ball, earning Davis a yellow card for his protestations. Substitute Sam Jordan then looked to be in after the ball was worked to the right-hand side of the box, but Breeden was again down well, producing a strong hand at full stretch to divert the effort away from goal. The pressure kept on coming, however, and after Jake Wannell slung a cross into the box, Hood’s wild swing at the ball was followed by a lunge which sent Brooks tumbling. Davis held his nerve from the spot and Hood was denied a chance to atone for his error deep into stoppage time when Mark Coooper produced a superb last-ditch challenge to prevent him poking home the loose ball after Edwards’ flick-on had been clawed off the line by Thomas. BRAKES: Tony Breeden, Ben George, Tom James, Darren Pond, Jamie Hood, James Mace, Zak Lilly (Joe Magunda, 63), Jack Edwards, Ryan Rowe, Rob Thompson-Brown (Courtney Baker-Richardson, 84), Ahmed Obeng. Subs not used: Richard Taundry, Ryan Quinn, Lee Moore. Weymouth: Dan Thomas, Mark Cooper, Jake Wannell, Billy Lowes (Chris Shepherd, 73), Stephane Zubar, Calvin Brooks, Dean Evans, Charlie Davis, Stewart Yetton, Ben Thomson (Sam Jordan, 81), Aaron Rodriguez (Dan Smith, 81). Subs not used: Ashley Wells, Jason Matthews.